Will Mobile Transform Canadian Fundraising? Incorporating mobile support into fundraising programs has transformed individual giving in many countries around the world. It has re-invigorated tired channels and created new ways to engage supporters. Could mobile deliver the same big changes to Canadian fundraising? Mobile fundraising engages new and existing supporters through text-to-donate, text-to-support and text-to-get campaigns. It is a way you can reach out to new supporter audiences and start a conversation. These individuals can take their support even further especially by becoming monthly donors. At first, mobile text-to-donate was a simple and effective channel for generating high volumes of small onetime cash gifts. Over the past few years the mobile channel has evolved significantly. Today, mobile fundraising has extended beyond one-off text donations to incorporate advocacy, the provision of information, and more importantly to drive monthly giving acquisition strategies. For many organizations, mobile now plays a crucial role in fundraising strategies and plans. The Mobile Giving Foundation (MGF) regulates text donation programs in Canada. They recently allowed three charities to run pilot text-to-donate programs that included permission for charities to follow up the text message with a phone call. The phone call was an opportunity to thank the donor and to ask if they would continue this support by making a monthly gift. As a result of these pilot projects, 2016 saw a significant growth in mobile fundraising in Canada. These pilot projects have demonstrated mobile’s power as a channel to reach a new audience and acquire leads for conversion to monthly giving. UNICEF was the first charity to test this approach out in Canada. It ran a successful text program in late 2015 and early 2016 with an appeal focused on the plight of children in Syria. The follow-up call to thank the text donor and to ask for a monthly gift delivered a response significantly higher than that delivered on standard conversion programs. 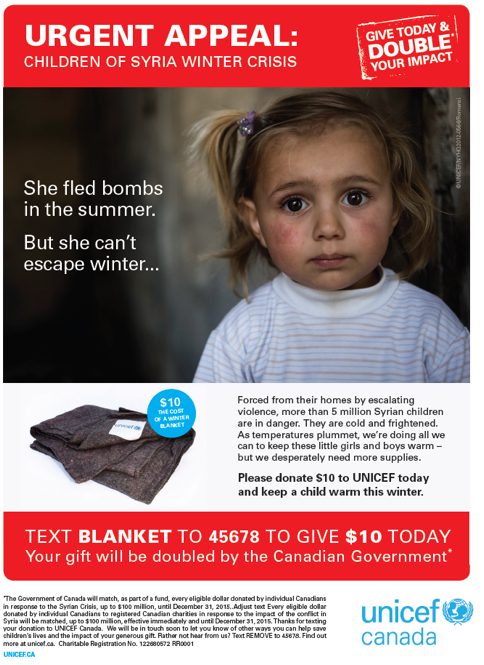 UNICEF Canada’s mobile text-to-donate campaign in support of Syrian refugees. Probably the most significant and impactful text campaign in Canadian fundraising history came soon after. The Canadian Red Cross Text Donate Appeal in support of the Fort Mc Murray Wild Fires ran in the summer of 2016. Response to this appeal was unprecedented with over 250,000 individuals Canadians texting in a donation to support the relief effort. The follow up conversion calls were equally successful and highlighted just how effective this channel can be for acquiring monthly givers. 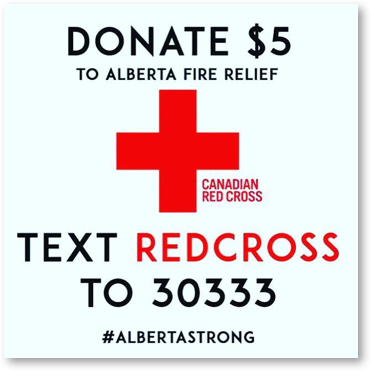 Canadian Red Cross mobile text-to-donate campaign in support of the Fort Mc Murray Wild Fires. The most significant and impactful text campaign in Canadian fundraising history. Testing the Canadian market for mobile has gone beyond text-to-donate. Fundraising Direct has been working with a number of clients to test the use of mobile for advocacy and information provision. The goal is to generate leads by offering something of value to supporters and then following up those text leads with a conversion-to-monthly phone call. As these programs do not involve a text donation they are not subject to MGF limitations. Fundraising Direct ran two notable text-value-exchange programs last year. The Canadian Red Cross launched a First Aid Guide mobile project. And Plan Canada ran an advocacy campaign against child marriage. Both campaigns were successful and effective ways to acquire leads for monthly giving conversion. 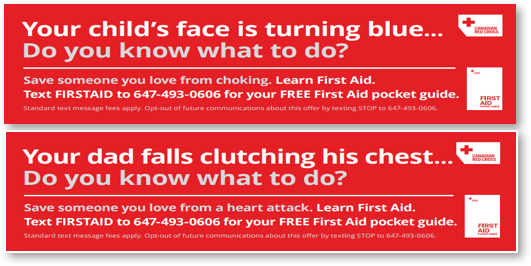 The Canadian Red Cross launched a First Aid Guide mobile project. 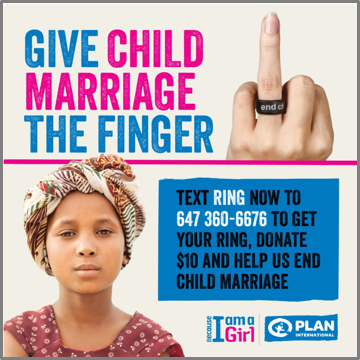 PLAN’s mobile text-value-exchange saw supporters wearing a ring to protest child marriage. Fundraising Direct started 2017 with another innovative text-value-exchange program with the Centre for Addiction and Mental Health (CAMH). We were able to seamlessly merge their mission objective – getting more Canadians to have the right kinds of conversations about mental health ­– with their fundraising objective of finding more supporters who are engaged with their cause. 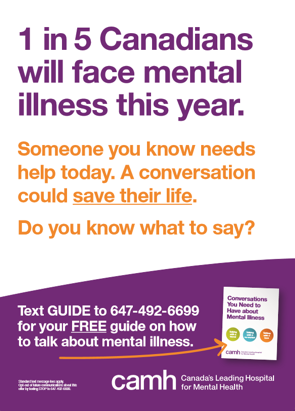 CAMH’s mobile text-value-exchange encouraged healthy conversation about mental health in Canada with a useful guide on what to say. 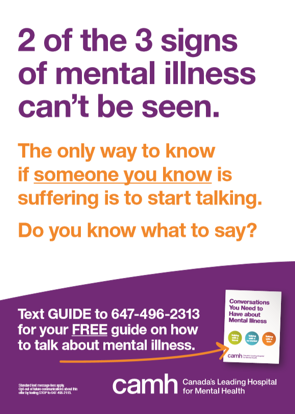 People who texted to get the guide are called to thank them for their interest and support. The call also involves a discussion with the supporter about their willingness to support the charity through a monthly gift. This type of program perfectly illustrates how both a charity’s mission and fundraising goals can successfully be combined into one integrated approach. Why are all these organisations testing mobile? Because mobile lets you reach audiences that are new to your particular charity, audiences that have a younger, wealthier profile. These mobile audiences are very responsive to a follow up monthly giving request. They convert at rates often double or triple to that of a typical cash file. Fundraising Direct knows that mobile offers a new and exciting channel for Canadian charities to build their monthly giving files. Many of our clients think so too. Don’t be surprised if you see many more out of home and digital mobile text response campaigns in the Canadian market place in the months and years ahead.